Shopping in Barcelona is an unforgettable experience. If you are addict to shopping then you are at the right place as so many shops are open till 10.00 pm. In order to feel the atmosphere of the shopping in Barcelona city here is a video. You can find many shops selling goods from traditional to trendy things. 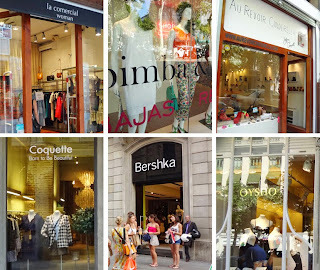 So when you decide a Barcelona city travel we suggest you to be prepared to spend money on shopping during your trip in Barcelona city but don't forget that there are huge sales twice in a year which we mentioned in earlier post about shooping in Barcelona city. So don't hesitate to shop as there are lots of options for everyone's budget. Have a nice shooping in Barcelona city. We will keep on posting updated subjects about Barcelona city in order to be your Barcelona city travel guide. Thanks for following us.